VW says it tried to create an energetic look in the body with a minimum of lines with the new Sharan's styling. MUNICH -- After waiting 10 years to replace its Sharan large minivan, Volkswagen hopes to capture lost ground by offering a new model that it claims is the most fuel efficient in its segment. The latest Sharan's most economical engine, a 140-hp, 2.0-liter diesel, uses 5.5 liters of fuel per 100km and has CO2 emissions of 143 grams per kilometer. The Sharan was also designed to be one of the most aerodynamic minivans on the market with a Cw value of 0.299 representing a 5 percent improvement over the previous model, VW says. The Sharan also offers stop-start technology and battery regeneration as standard equipment on most engine variants. Heike Stibbe, the executive responsible for mid-sized vehicles at VW, said the carmaker believes the Sharan's new features will help arrest the minivan's declining sales. “With new technology and practicality, we think we can turn around the trend of declining interest in large minivans," he said at a press event here to launch the latest Sharan. The Sharan has a new folding seating concept that enables the individual second-row seats to be folded into the vehicle floor to maximize cargo space. 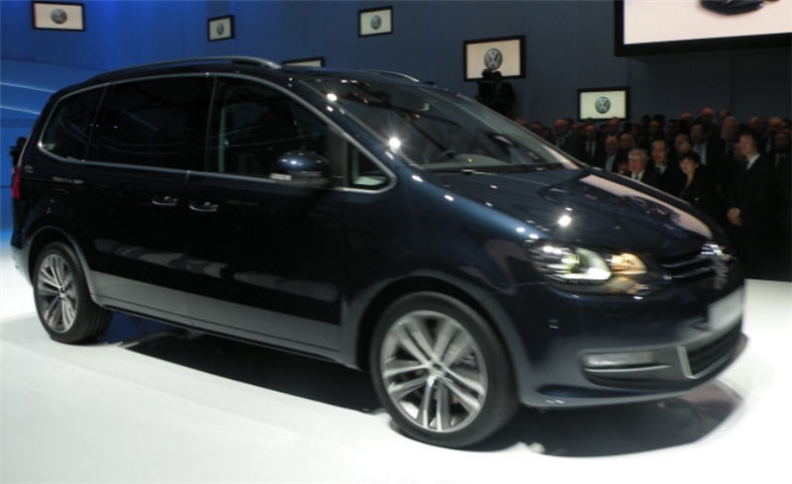 VW says the third-generation Sharan is the only minivan in its class to be available with all-wheel drive. At 4850mm, the Sharan is 220mm longer than the current model and 30kg lighter. When it launched in 1995, the Sharan was built with the Ford Galaxy in Setubal, near Lisbon, Portugal. Ford pulled out of the joint venture and launched its own Galaxy, built in Belgium, in 2005. The latest Sharan is built on a platform that uses elements from the front of the VW Tiguan medium SUV and the rear of the Passat mid-sized sedan. The Sharan will be sold in Europe, China and Japan, but not in North America where it is considered too small for the needs of U.S. large minivan buyers. In the United States, VW sells the larger Routan, a variant of the Chrysler Town and Country minivan. Main competitors: Renault Espace, Ford Galaxy, Citroen C4 Picasso. Average annual sales forecast: 30,000. Base price: 28,875 euros (Germany). Launch date: End of August (Germany). Best bits: The Sharan's seating options make the minivan suitable for families or business users. The 6-seat option has no middle seat in the second row, offering business passengers added comfort. In the 5-and 7-seat variants, the second row has three seats.